W ho says you have to do country style when designing in the country? 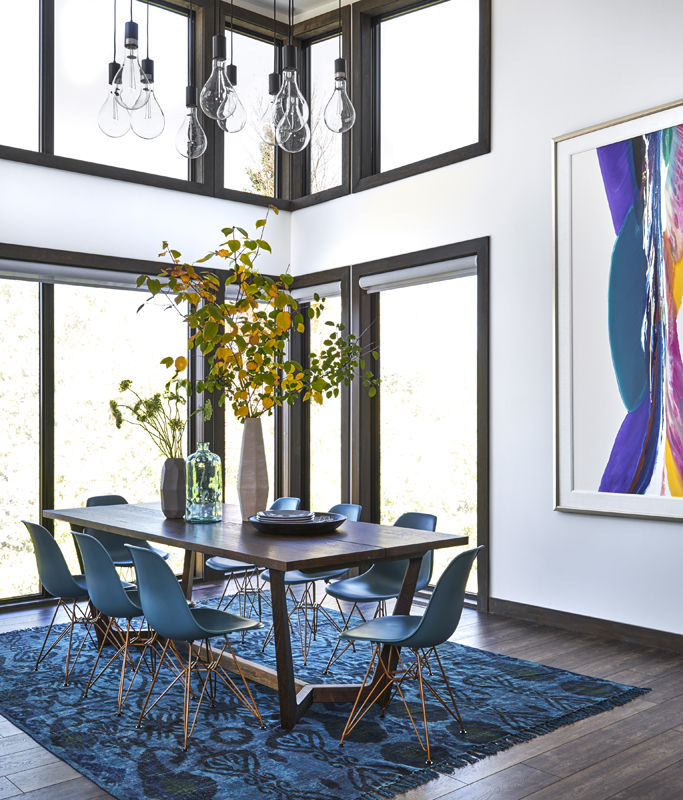 When Sara Bederman Design was brought in to design the interior of a country home on an ultra-modern family cottage compound in the Kawartha Lakes region, the team was eager to define the direction of the interior. 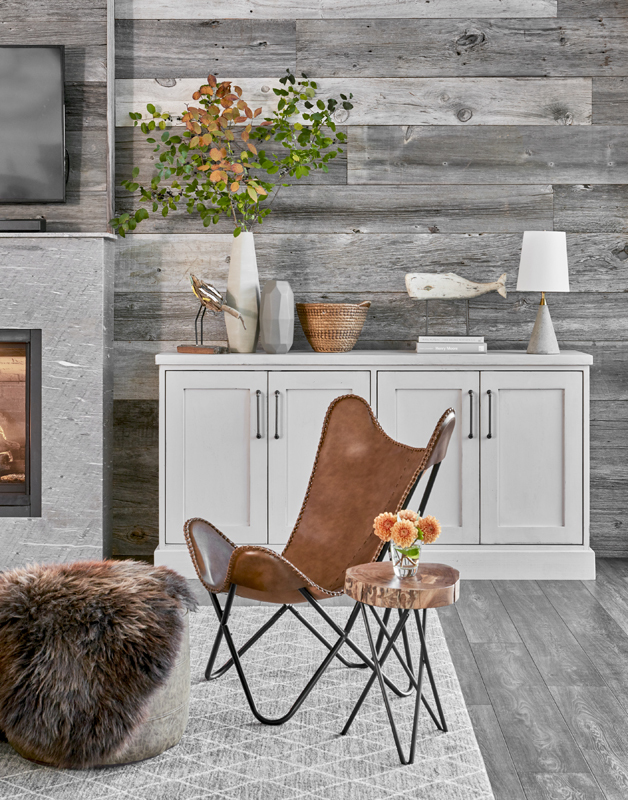 Would it be country rustic set in the modern architecture of the home or did the client wish to continue the ultra-modern aesthetic throughout the interior design as well? 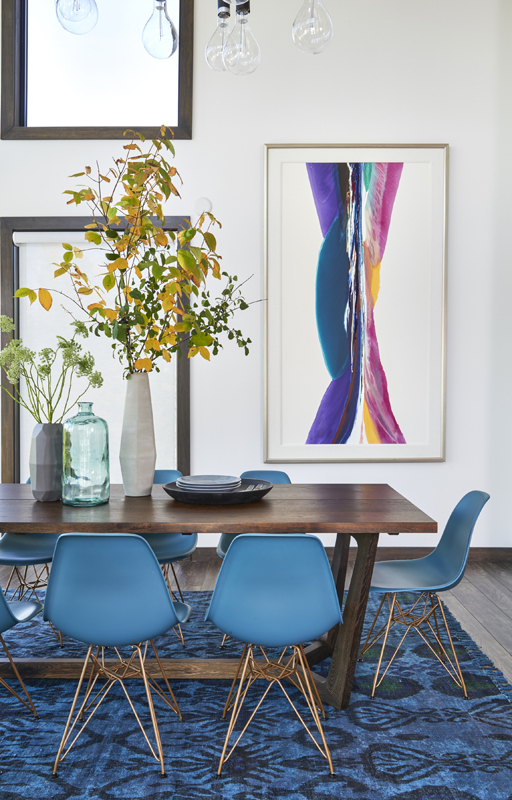 True to the values of her design studio, Sara Bederman knew that the first thing to do was to consider the impact that the outside surroundings had from inside the home. 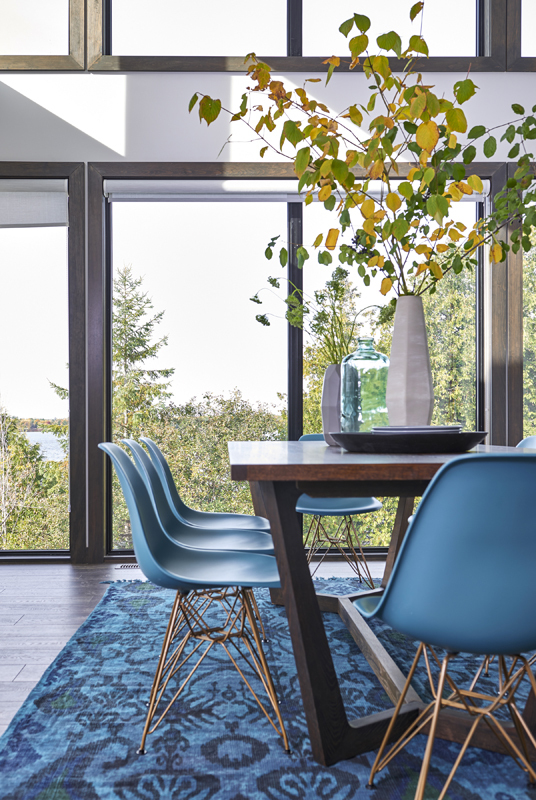 The huge glass windows that looked onto the lake established an immediate connection to the natural setting of the home. What happened inside had to enhance the beauty filtering in from the outside. 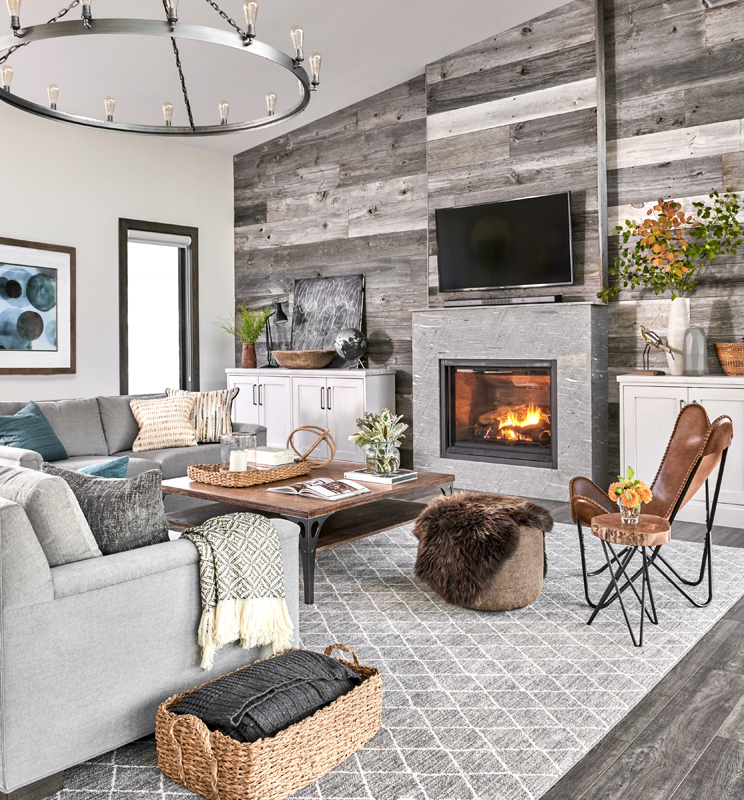 In addition, as 1 of 3 new cottages built on the property, Sara wanted to make sure this home was a true reflection of the homeowners, a place that told their story and reflected their desired aesthetic. With 3 young children, this cottage had to be ready to take on a lot of playing, entertaining and nesting. Sensible finishes were essential, but beauty was not to be compromised. The kitchen, set as open concept to the adjacent great room, was efficiently laid out to maximize ease of use. Fast paced food preparation was definitely the future for this kitchen so storage and organization solutions in the cabinet interiors were provided. Appliances were planned in an efficient triangle with a wide isle through the middle of the working counter and oversized island. Clean, contemporary white cabinets were topped with a hardworking white quartz countertop. This combination was sure to offer freedom of use and easy maintenance. Hardwood style vinyl flooring was specified to add a warm, no nonsense floor cover that could withstand wet swim towels, sandy feet and even snowy boots. The goal for this kitchen design was to provide an overall timeless style while serving all the diverse and demanding needs required by this family. Sara and her team made sure that each of their client’s goals were not just achieved, but surpassed. Stainless steel appliances added an industrial element to the space and gave the kitchen an urban edge. 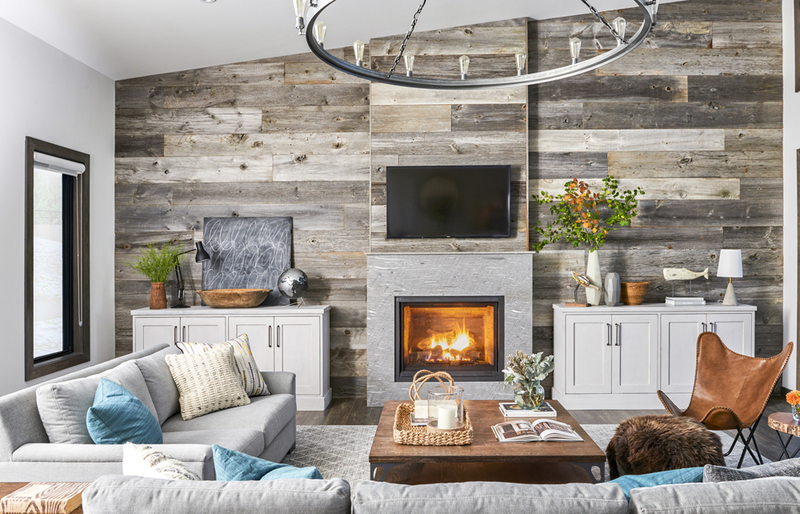 The highlight of this family-friendly kitchen was definitely the gorgeous reclaimed barn board wall cover. This finish added warmth and texture to the otherwise sensibly finished kitchen. 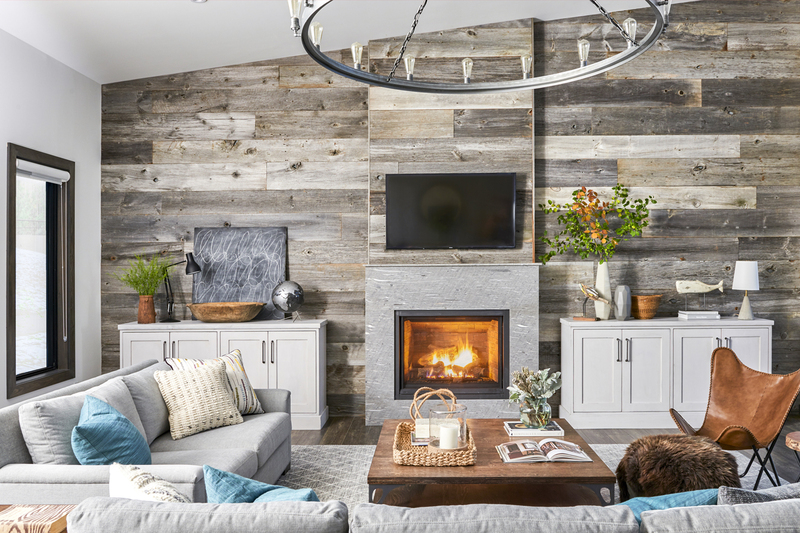 The barn board feature was a nod to the beautiful, tree filled landscape filtering through the spectacular large windows found all around the home and an unexpected finish in the ultra-modern architecture of the home. 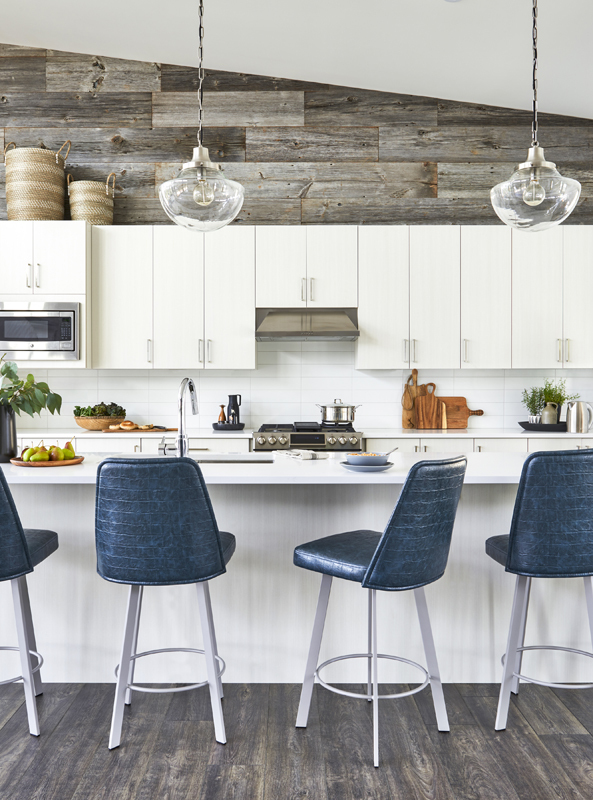 Seated at the long kitchen island, atop the sturdy swivel stools, beautiful views can be found wherever you turn. 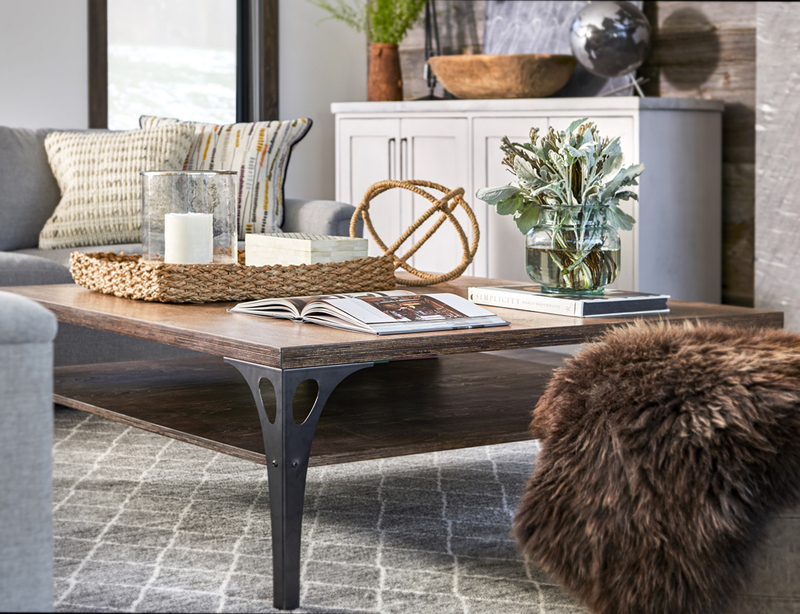 Whether it be the lake, the land or the interior of the beautiful home, balance and harmony meet hardworking and family friendly. This home offers retreat from city life all year long and is a getaway the clients look forward to enjoying at every opportunity.